Alien Arena is a free, stand-alone first-person shooter computer game based on source code released by id Software. Begun by COR Entertainment in 2004, the game combines a 1950s-era sci-fi atmosphere with gameplay similar to the Quake, Doom, and Unreal Tournament series (via Wikipedia). 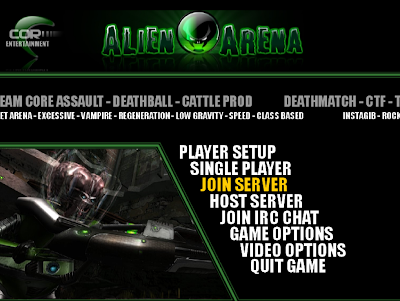 Alien Arena 2011 (7.50) has been released today, just in time for those who have some free time during the holidays. The new version includes new ragdoll physics using the Open Dynamics physics engine ("ragdoll physics are a type of procedural animation that is often used as a replacement for traditional static death animations"), revamped in-game IRC client, two new maps (Annihilation and Neptune), one revamped map, new music, true type font support, tweaks and much more. A complete changelog can be found here. Then press ALT + F2 and enter: "crx" (without the quotes) to run it. Note that the above instructions are only a rough guide for those who know how to compile packages! If compiling is not your thing, wait for Alien Arena 2011 to be added to PlayDeb.net.